Competitive Shooting Sports have taken off as a major interest to people in the firearms community. Point Blank Range holds several action-filled matches each month which are always a big hit with our shooters and are rapidly gaining attention in the area. If you haven’t been involved in competitions before though, where do you begin so you can enjoy the fun and challenge yourself too? Intro to Competitive Shooting Sports (IDPA & USPSA) is an introductory training class to familiarize students with different options in the competitive shooting world. If you have shot for a short time or a long time and are looking for the right Competitive Shooting Sport, particularly the competitions hosted here at PBR, this is the class for you. Students will be learning what kind of firearms and gear is needed, the rules of each sport, the specific range commands, targets used, and scoring for each different competitive shooting discipline. 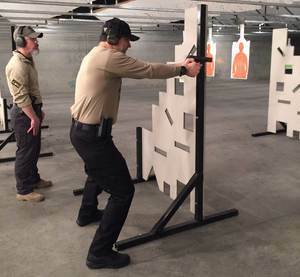 These classes will also involve some range time and shooting. So if you always wanted to get into one of the competitive shooting sports but were afraid to ask or not sure where to start, this is it.